Now that you’ve managed to get some traffic to your website, you want to make sure that your visitors leave with a conversion. But what if they don’t? Do you know that you could still connect with them and get them to come back through remarketing? The original marketing concept is called retargeting. Bing called it remessaging, and when Google jumped in, they called it remarketing. They all mean the same thing – a technique to recapture users who have previously visited a website, by showing them retargeted ads which should convince them to come back and complete a conversion. For purposes of this blog, we’ll call it remarketing. A user starts gets introduced to your site, either through search, display, or direct means. He proceeds to visit your site. Ideally, you’d want him to leave your site with a conversion, but this doesn’t always happen. While the user is on your site, a tracking cookie is placed on his device. This cookie is responsible for remarketing magic. When the user exits your site and goes on to browse other websites that are part of the Display Network, your ad would show up for him to see, subtly reminding him of your business. If your ad was able to fire up his interest, he would visit your site again, and hopefully leave with a conversion this time. Take advantage of warm leads. Users who visited your site already showed a degree of interest in your business. With remarketing, you can stay engaged with them and be the top of mind brand, until you can convince them to pick up where they left off and complete the journey to conversion. Also, this technique is best for when you are already interesting enough to get a decent amount of quality traffic, but not a lot of conversions. Reach out to previous visitors who have leaked out of your conversion funnel instead of focusing only on getting new leads. 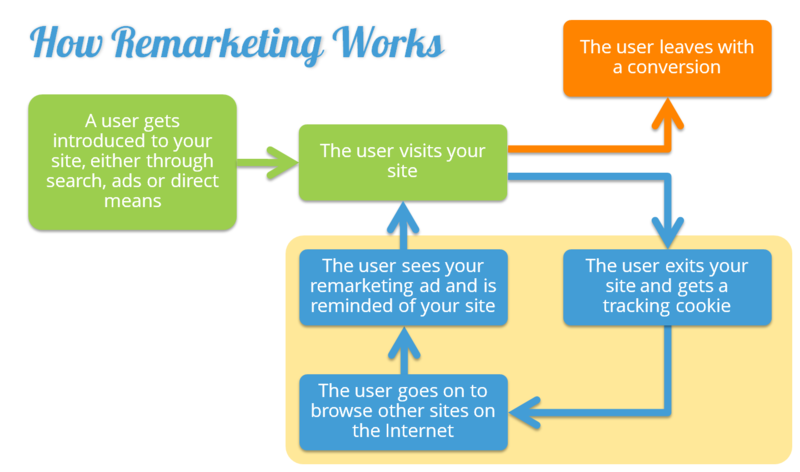 How Can You Get Started With Remarketing? First, identify and segment your audience. For example, if you are in the online boutique business, you can segment your audience based on the pages they visited (e.g. kids’ wear, shoes, accessories, etc). You could also target those who have already converted and get them to check out new offers. Next, add remarketing codes to your pages. This will plant the cookie on to your visitor’s device and enable your ads to show up on sites that he is browsing. Next, create tailored ads for each audience segment. Highlight your tempting offers and use clear call-to-action. Now all you have to do is run your ads and get them to come back! Of course, advertisers should expect that users respond to remarketing efforts differently. Several factors could affect the time frame from initial engagement to conversion, such as the type of product and its price range. Also consider that users are not comfortable with feeling like they’re being stalked and haunted, so limit ad exposure to a tolerable number that’s carefully distributed over time. Need help setting up remarketing campaigns? Let us know and we will gladly assist you!